Diamela Atencio V: FORCE MAJEURE: HOW IRMA COULD AFFECT YOUR CLOSING. FORCE MAJEURE: HOW IRMA COULD AFFECT YOUR CLOSING. Beginning late last week and continuing today, our office has fielded inquiries regarding potential problems arising in connection with Hurricane Irma and existing homes currently under contract. Below, please find common questions we have received and answers to such questions. 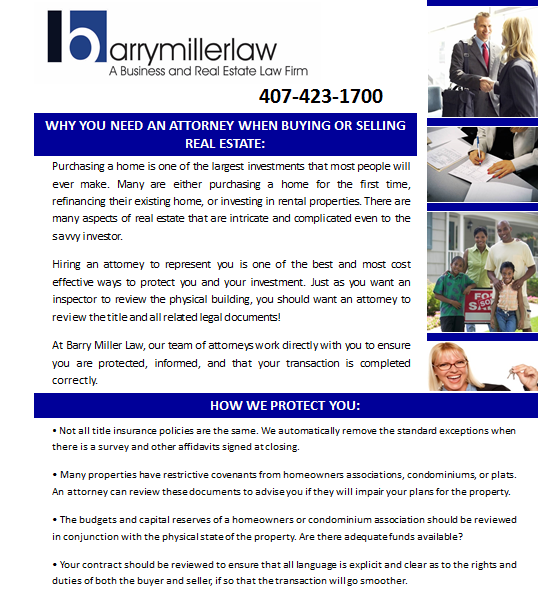 Please contact Barry Miller Law at 407-423-1700 or email Info@BarryMillerLaw.com if you have any questions concerning Irma's impact on existing transactions. Q: DOES A BUYER HAVE A RIGHT TO REINSPECT THE PROPERTY? Unfortunately, the Buyer does not maintain any right to reinspect the Property after Hurricane Irma under the FR/BAR after the initial inspection period has expired. However, pursuant to Paragraph 11, "Property Maintenance," the Seller shall has an obligation to maintain the Property, including, but not limited to, the lawn, shrubbery, and pool in the condition existing as of the effective date ("AS IS Maintenance Requirement"). Therefore, the Seller must keep the property in the same condition existing as of the Effective Date.The Buyer can also perform a walkthrough on the day prior to Closing. Pursuant to Paragraph 12(b), Buyer may perform a walkthrough inspection of the Property...and to verify that Seller has maintained the Property as required by Paragraph 11, as aforementioned. Q: RISK OF LOSS AND SELLERS DUTY TO REPAIR. IF THE PROPERTY IS DAMAGED, IS THE BUYER REQUIRED TO CLOSE? FR/BAR Standard M: If the cost of restoration (including pruning or removing damaged trees) does not exceed 1.5% of the Purchase Price, the Seller is obligated to repair the damage and proceed to closing. In the event the restoration is not completed prior to closing, 125% of the estimate is to be escrowed. Foreseeable Issue: Who determines what "estimate" to follow for purposes of this term? The FR/BAR Contract is silent as to this terms definition; therefore, we recommend that the parties attempt to procure at least two estimates for the restoration of any damage. Note:Seller's sole obligation with respect to tree damage by casualty or other natural occurrence shall be the cost of pruning or removal. Q: WHAT IF THE BUYER STILL WANTS TO CLOSE, EVEN THOUGH THE DAMAGE EXCEEDS 1.5% OF THE PURCHASE PRICE? In the event the damage to the Property exceeds 1.5% of the Purchase Price, the Parties may proceed to closing if they agree. In the event the cumulative damage exceeds 1.5% of the Purchase Price, it is advised that the Seller submit a claim to their homeowner's insurance policy and assign the insurance claim to the Buyer. If the Parties wish to proceed this route, Barry Miller Law can prepare the Seller's assignment of the insurance claim to the Buyer for a flat fee starting at $495.00. Q: DOES FORCE MAJEURE ALLOW FOR THE INSPECTION TO BE DELAYED? Force Majeure is governed by Standard G of the Contract. Force Majeure means: hurricanes, floods, extreme weather, or other acts of God...which by exercise of reasonable, diligent effort, the nonperforming party is unable in whole or in part to prevent or overcome. If it's determined that Force Majeure applies, the Parties shall not be required to perform any obligation under the Contract so long as performance or non-performance or the availability of services or required approvals essential to Closing cannot reasonably or diligently be procured. Under this standard, the Closing Date will be extended a reasonable time up to seven (7) days, after the Force Majeure no longer prevents performance. So, a lack of power to the Property would likely prevent performance under the Contract and would likely constitute a Force Majeure. Q: WHAT IF THE DAMAGE IS UNDER 1.5% AND THE BUYER'S LENDER REFUSES TO CLOSE? Buyer shall provide written verification from Buyer's mortgage broker or lender of the Loan Approval, in accordance with the terms set forth in this Contract, to Seller. If Buyer fails to obtain Loan approval within the time set forth and thereby terminates this Contract, Buyer shall provide written verification of same and the reason for such denial to Seller. Q: WHAT IS "ESSENTIAL" FOR CLOSING? Under Paragraph 5(b), Closing will be extended if Force Majeure causes "services essential for Closing to be unavailable." Services essential for Closing is not defined in the Contract; however, the Contract does state that availability of utilities is essential. Q: WHAT IF THE BUYER REQUESTS TO EXTEND THE INSPECTION PERIOD UNDER FORCE MAJEURE? If the services necessary to perform the inspection are able to be procured by the Buyer through reasonable, diligent efforts, (i.e. inspector), there would not be any delay or extension of the Inspection Period; however, if there's no power to the Property and the Inspection Period has not expired prior to the Force Majeure, the Inspection Period could be extended for a reasonable time not exceeding seven (7) days. Q: WHAT NEEDS TO BE IN WRITING? Please remember that anything agreed to must be in writing and signed by both parties. Agents must remain mindful and be cautious that they do not draft legal terms and conditions which may constitute the unauthorized practice of law (UPL). Our Attorneys are available to assist agents, Buyers and Sellers with questions and drafting need Addendums. All references contained herein are to the 2017 FR/BAR "AS IS" Residential Contract for Sale and Purchase.